Insects play a valuable role in natural communities . They provide food to birds and other animals, and they help break down organic matter . But non-native insects can devastate entire natural communities. 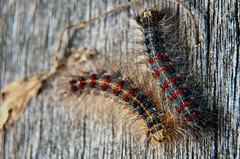 Gypsy moth caterpillars are destructive, each one eating up to one square foot (929 square cm) of leaves per day! Gypsy moth defoliation and mortality can create extensive sunlit openings in the forest canopy , allowing understory trees such as red maple to grow.2 In combination with over-browsing of oak seedlings by deer and the presence of non-native invasive plants , large opening such as these can result in a complete shift in forest canopy composition. 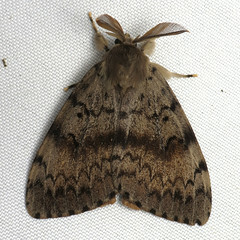 An adult male gypsy moth. Native to Europe and Asia, the gypsy moth became established in America in the late 1800s, and reached the mid-Atlantic region a century later. Photographer: Leah Bauer/USDA FS Northern Research StationThe emerald ash borer (Agrilus planipennis) could be as devastating to ash trees in the U.S. as the chestnut blight was to American chestnut a century ago. This half-inch long, Asian metallic green beetle is a relative newcomer to America. First found in 2002 in Michigan, the emerald ash borer spread among ash trees quickly, often hitching rides on infested firewood and nursery stock. By 2009, it had reached twelve states including Virginia and Maryland, and two Canadian provinces, killing hundreds of millions of trees. Emerald ash borers (Planipennis agrilus) bore paths just below the bark of ash trees (Fraxinus spp.). Researchers are working to identify and develop biological control agents for emerald ash borer. Photographer: Changhua Coast Conservation ActionThe Asian long-horned beetle (Anoplophora glabripennis) is a large and extremely destructive beetle that was probably imported from East Asia in wooden packing material in the 1990s. Host trees include maple, box-elder, elm, birch, American sycamore, and willow. 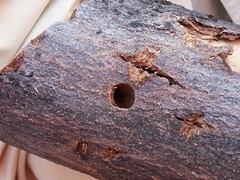 The Asian long-horned beetle’s larvae tunnel through the tree’s vascular system and heartwood, eventually killing it. The white-spotted, glossy black bodies of these winged adult beetles are ¾–1 ½ inches long. Their black-and-white banded antennae are up to 4 inches long! They should not be confused with the duller whitespotted sawyer which attacks conifers. 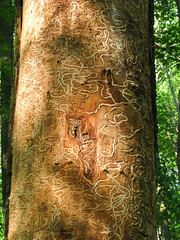 Infested trees must be cut down (after the first frost kills adult beetles) and chipped or burned to prevent spread. Early detection is crucial for beating the Asian long-horned beetle. You can help; visit the website beetlebusters.info to get started. A viburnum leaf beetle (Pyrrhalta viburni) on a skeletonized viburnum leaf. This Eurasian beetle arrived in the United States in the early 1990s. By 2008, it had been documented in New England, New York, New Jersey, Pennsylvania, Ohio, Michigan as well as Ontario and the Canadian Maritime Provinces. The adult is a tiny brown adult beetle the size of a matchstick head. It lays eggs in imperfect rows of chewed holes underneath younger twigs in summer and until the first frost. An adult viburnum leaf beetle, a dangerous pest for viburnum shrubs. Photographer: Flickr user Ettore BalocchiIn spring, tiny pale larvae emerge to feast on viburnum leaves, eating their way through three stages of change, and leaving behind skeletons of leaf veins. 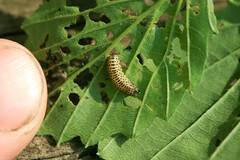 Then they crawl down the plant to build a cocoon in moist soil . 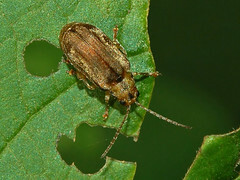 Later in the summer, the adults emerge, find undamaged leaves, and eat little oblong bullet-holes through them.11 Repeated infestation can kill the plants. The most effective control of this pest is to prune and destroy egg-infested twigs from late fall to early spring. Beneficial insects like ladybug larvae and adults and even certain stinkbugs feed on the viburnum leaf beetle or its larvae. Photographer: MichaellbbeckerThe sirex woodwasp (Sirex noctilio) is a pest of pine trees and other conifers. It arrives in the United States in pallets of wood from infested trees. By 2014, sirex woodwasp had been found in New York and Pennsylvania, and scattered areas in Michigan, Connecticut, New Jersey, and Vermont. 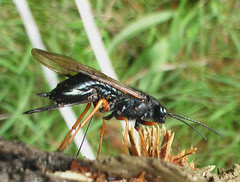 The first woodwasp was found in Indiana in 2002. It is considered a particular threat to plantations of pines in the southeastern United States. When laying their eggs, female sirex woodwasps inject a fungus and irritating mucus into weakened or stressed pine trees. The fungus feeds their larvae, and further weakens the tree. In other countries where it is an invasive pest, the woodwasp often attacks loblolly trees on pine plantations. "An ounce of prevention is worth a pound of cure." The sooner someone notices telltale signs of an insect invasion and speaks up, the better chance there is of controlling it. Whether it's in your own neighborhood or in a park, resource managers need your set of eyes to help keep a vigilant watch for these insect pests! Some of the insects, such as the viburnum leaf beetle13 and the Asian long-horned beetle14, are the subject of citizen science projects designed to track their spread. 1. US Department of Agriculture Forest Service. 2003. Gypsy moth in North America. 3. Schuster J, Nixon PL. 2008. Focus on Plant Problems: Gypsy Moth. 5. US-Department-of-Agriculture-Forest-Service, Michigan-Department-of-Agriculture, et al. 2008. Emerald ash borer. 6. USDA Animal and Plant Health Inspection Service. 2017. Asian longhorned beetle. 7. Canadian-Food-Inspection-Agency. 2008. Asian longhorned beetle - Anoplophora glabripennis. 8. USDA Animal and Plant Health Inspection Service. 2017. Asian longhorned beetle. 10. University C. 2016. Viburnum Leaf Beetle. 11. University C. 2016. Viburnum Leaf Beetle. 12. USDA Animal and Plant Health Inspection Service. 2008. Proposed Program for the Control of the Woodwasp Sirex noctilio F. (Hymenoptera: Siricidae) in the Northeastern United States. 13. University C. 2016. Viburnum Leaf Beetle. 14. USDA-Animal-and-Plant-Health-Inspection-Service. 2014. 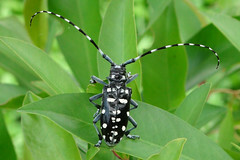 Asian longhorned beetle.